People who are trying to find the ideal material for a high-end patio certainly ought to consider using flagstone. Choosing artificial or manufactured materials for your patio is not recommended. The most obvious reason behind using natural materials such as flagstone is the fact that they are, of course, more appealing compared to synthetic ones. Flagstones are an outstanding option due to their natural splendor. This material provides an air of sophistication to any project. Flagstones are particularly well suited for patios and walkways due to their appearance and natural durability. Using these kinds of stones will surely provide a natural elegance to your home. One of the reasons why people want flagstones over other kinds of materials is its natural vintage look. These stones come in many different colors such as grey, red, blue, green and even white. They have a certain kind of shimmer that is quite pleasing to the eye. Some people like to mix and match different colors, shapes and sizes of flagstones to create a unique patter, you can also mix flagstones with other kinds of stones to create a wonderful effect. First, you need to measure your patio area and shop for the flagstone. Make sure you purchase enough to completely pave the area with some extra for backup. You need to have calculated to have enough sand and gravel to fill in for at least twice the depth of your pavers. This means if you are using 2 inch stones you need to dig 6 inches and layer at least 2 inches of gravel AND 2 inches of sand. If you live in an extremely dry climate such as a desert, or already have granite or pure sand soil, then a foundation with 2 inch depth should be fine. You also need to decide on the shape, depth, and style of both your pavers and your patio. Flagstone pavers come in a variety of colors and you can find them precut into tiles, rough edged, or smooth edged. Precut tiles are great; they lay evenly together and fit snugly. Many people like the rustic look for the uncut versions, but these require a sense of creativity and preferably some technique in fitting them together similar to a jig saw puzzle. 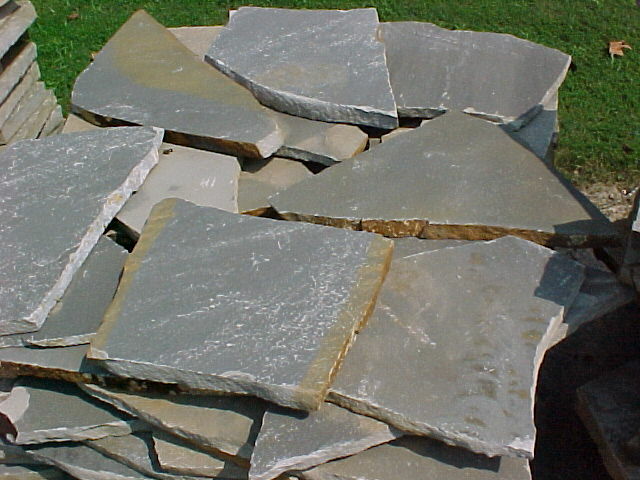 Precut, rough edged flagstone is also nice as they usually fit together better and still have that natural look to them. 1. Once you have measured off your patio and purchased the necessary amounts of gravel, sand, and pavers, its time to start digging. Hopefully by now you have determined the size and shape you would like your patio and have marked it off beforehand. This step is simple. If you like a square or rectangular patios measure it off accordingly. If you want a round or odd shaped patio, simply use the spray paint to mark off where you want the patio edge to be. 2. Start digging. 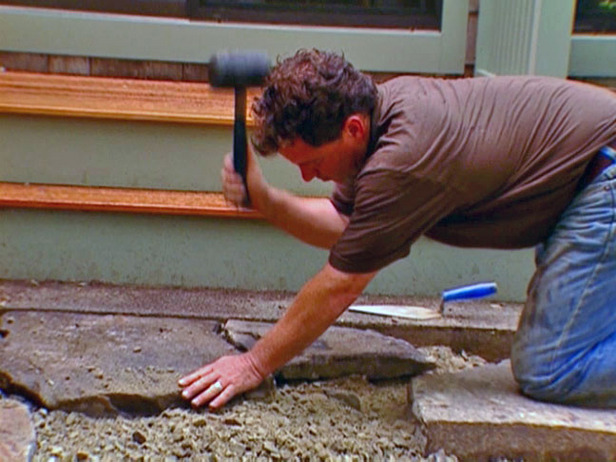 Using the flat spade to cut into the earth, dig down the required depth all around the edge of your patio silhouette. Then begin soil removal with the round spade. Place this soil on a tarp or other designated spot. Continue digging out the foundation until the whole area is excavated. If you are planning on building a raised patio, you will still need to excavate the ground to a point where it is level. 3. If you are laying the patio up against a building make sure that the surface slopes away from the building to allow water to run away from the building, rather than towards it. Otherwise, make sure you obtain level ground. It is important that the solid beneath the patio is as level as possible and tamped down well. Irregularities or air pockets will spell trouble down the road. 4. Now place the landscaping fabric on the ground. Be sure to leave enough extra to overlap the edges. Then be sure you have already dug down from the edging material. 5. If you are using wood or other edging material be sure that the top edges of the wood are level with the bottom edges of the stone. You may have to dig down a bit. You can alternately use the wood as the final edging; just make sure it is level with the ground all around. The 2×4’s will be used for screeding later on. If you are using edging or landscaping stone, you may not need the 2×4’s or edging material. 6. Place gravel evenly on the surface of the landscape fabric and take your 2×4 and use it as a screeding device. At this point, it helps to have an assistant as they can be on the other side of the patio and help to level it. Be sure your gravel is very level. Tamp it down where necessary and fill in any air pockets or holes. If you are using the crushed granite, rock, or course sand on its own then you should only need about 1 and ½ times as deep as your flagstone rock. If you are also using course sand as a layer, you can wet down the granite and leave it to set over night for at least 12 hours. This will set it and it will be like working on cement. If you are NOT using sand, then skip this step. 7. After you have laid your foundation of gravel, sand, or both and made sure it is level then it is time to start laying your pavers. It is up to you if you start on one side, around the edge, or in the middle. 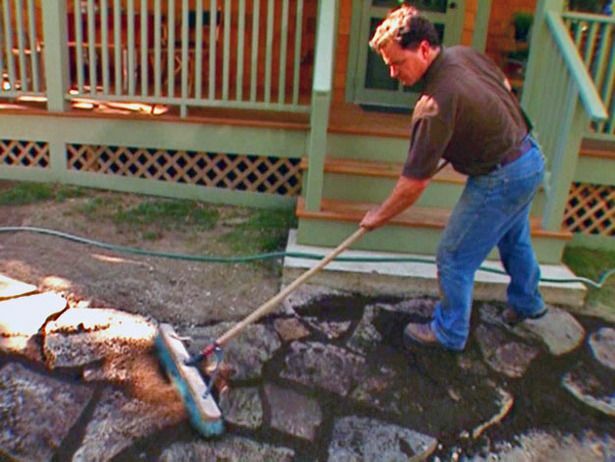 Generally if you are using large stones, precut stones, or want to make sure you have a finished edge it is best to start in the middle of a patio, or at one end of your walkway. If you want a natural edge, then it really does not matter where you start, just chisel the edges back enough so that they are all over your base layers and not up into the dirt where they will heave more. 8. 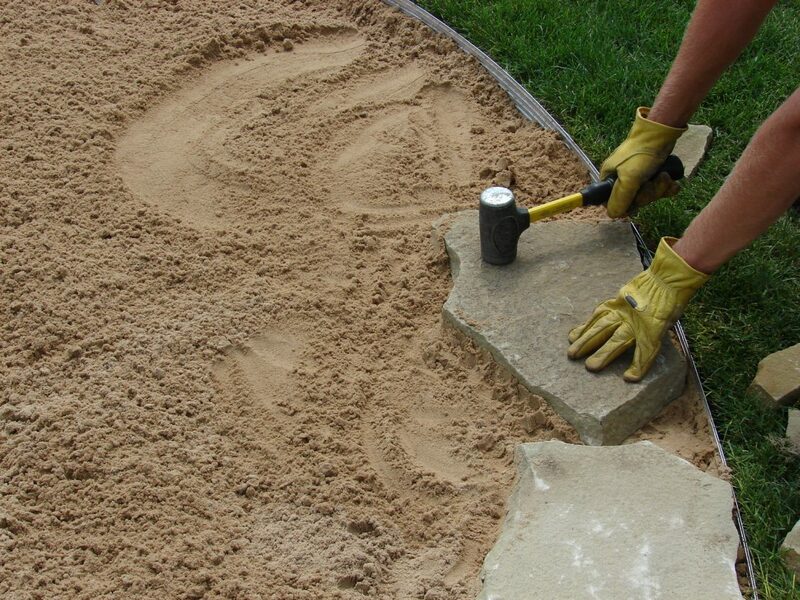 As you lay your stones, be sure to use a level and either add sand or gravel under them or remove it where necessary. If there are air pockets underneath or the stones rock or wobble, they will wear poorly and crack. Make sure all stones are firm. If you lay your stones closer together less water will seep through and they will need less maintenance in the long run. Just be sure to leave enough room so that water can seep through, or pooling will occur. 9. When you get to the edges be sure to wear your safety goggles. If you need to cut the stones to fit, then just lightly tap on a grooved edge on either side of the stone where you need the break to occur. Once the groove is deep enough, then lay the stone down so the edge to be broken is hanging over an edge and gently tap that edge with the mallet. It should snap off easily. 10. After you have laid your stone it is time to mortar it. If you have left your stones far enough apart from the crushed granite, or you are electing to use the granular granite sand, or any type of course sand, be sure to sweep it into the cracks and fill them up completely. You may have to water it into the cracks and refill them a second time. 11. Be sure to keep some sand or gravel on hand to fill in from time to time. If you live in rainy wetlands or areas that freeze and thaw frequently, heaving will occur. Heaving is easier to deal with if you have used course sand or crushed granite as opposed to regular mortar or cement. If you have decided to go with the cement and mortar concept, just be sure to use products that are designed to use with rock patios. 12. Maintenance is easy. When a stone has come out of place or shifted in any way, simply temp it down and add more sand or gravel until it is level again. Refill in the cracks too and re-wet the area. You can expect the patio to need this maintenance about once or twice per year in heavy heaving zones and less in dryer, warmer climates. This little extra maintenance is definitely worth the effort.